By default: You are a .NET developer who wants to develop and sell software for mobile devices. Microsoft introduced a new type of applications: the Windows Store apps. Windows Store apps have a brand new Windows 8 Metro interface, run on a variety of devices, and you can sell them on the Windows Store. 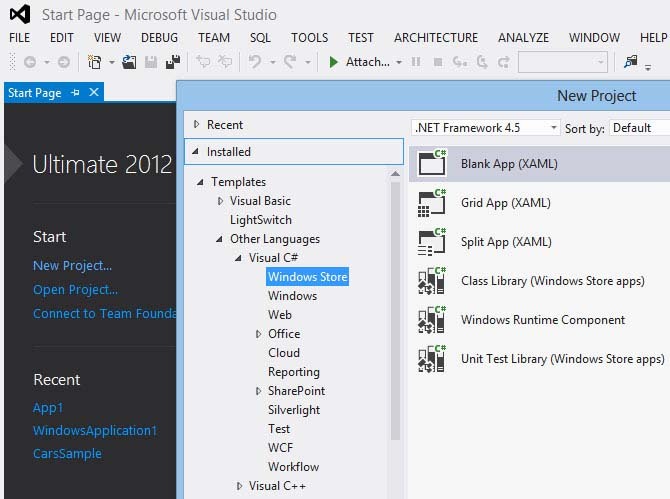 You may create your first Windows Store app using C# or Visual Basic in Visual Studio 2019. We will not teach you how to create a simple "Hello, world!" Windows Store app using Extensible Application Markup Language (XAML) in .NET technology (VB or C#). To learn how to build Windows Store apps go to some Microsoft tutorial website. We just will open VS2017 development environment and compile a blank WinStore application. Open it. Click ‘NewProject’, then ‘Windows Store’. 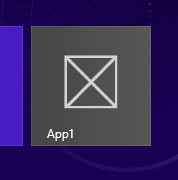 In the center pane, select the Blank App template. The Blank App (XAML) template creates a minimal Windows Store app that compiles and runs, but contains no user interface controls or data. You will add controls and data to the App1 app but not now. Now we will take a look what the code inside the App1 after it has been compiled. After compilation you will see App1 Metro style tile created. By clicking on the tile you will see gray screen. That is it. Press Alt + F4 key combination to close the App1 application. Close Visual Studio 2019. It will ask you to save the empty App1 .NET application project somewhere at your PC’s hard drive. Store it since we will need to browse the compiled App1.exe executable. You can easily locate the App1.exe in the Windows Store app project’s folder. You can see the application’s CIL script. CIL - Common Intermediate Language is the lowest-level human-readable programming language is used by the .NET Framework. The Intermediate Language is a language used as the output of .NET compilers (C# or VB). The Refractor .NET assembly browser program that you can freely download from Rustemsoft’s websites allows you to see CIL code in human-readable format. By using this utility, you can open any .NET executable file (EXE or DLL) and see CIL code. 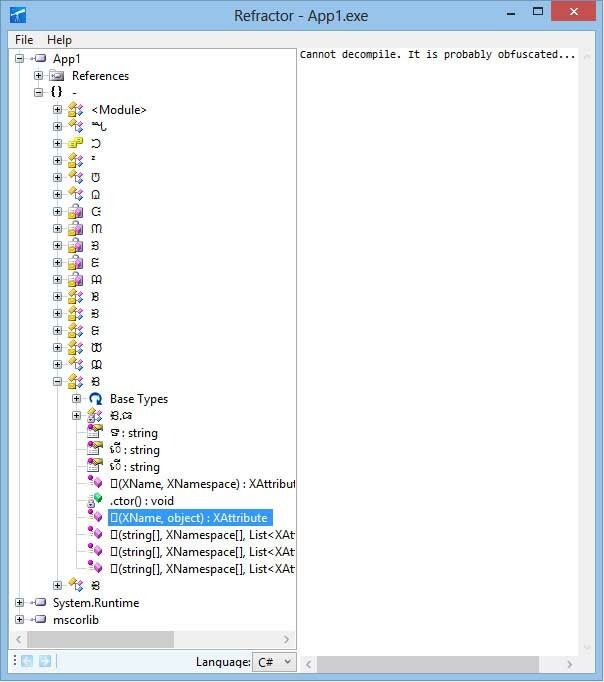 Moreover, by using the Refractor you will be able to decompile your App1.exe to high-level .NET language: C# or VB. So you can browse App1 compiled code. The decompiled CIL script looks not understandable. You probably now suggest your Windows Store app .NET source code will be available only to a private club of tech geeks who actually know CIL Assembly Language, think again. 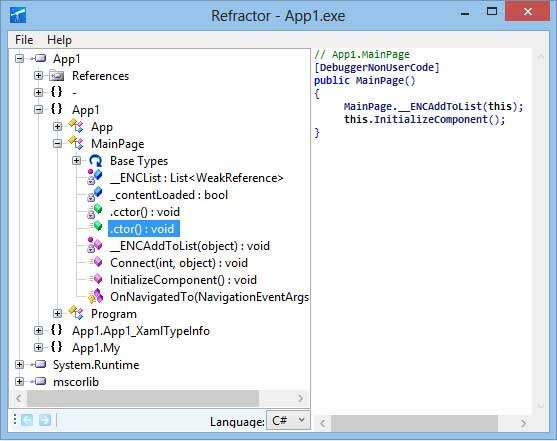 The Refractor decompiler program can decompile a Windows Store app directly back to a high level language like C#, VB, and C++. You need to obfuscate your Windows Store application .NET code because CIL (.NET Intermediate Language) code contains all of the information, apart from comments, that is in .NET executable (*.exe or *.dll) files. Using a .NET decompiler a rival competitor may easily reverse engineer your Windows Store .NET apps. To prevent this threat it is necessary to obfuscate your assemblies before distributing your software on Windows Store. The obfuscation process protects all needful information used by debuggers from your .NET code members. Also, class, interface, field and method identifiers are renamed to make them senseless. Using Skater .NET Obfuscator the obfuscation cannot be reversed. Skater .NET Obfuscator has both representations: as a GUI tool and as a software with command-line interface as well. Skater .NET Obfuscator is developed to be incorporated seamlessly into your WinStore application’s build process and it has the command-line interface to meet the requirement. Skater .NET Obfuscator can generate a non-recompilable executables. See how the Refractor presents obfuscated App1.exe below. As you can see all member names have strange characters representation. When you try to decompile a particular code method it says: 'Cannot decompile. It is probably obfuscated...' You may apply different Skater .NET Obfuscator methods and algorithms to better secure your .NET apps. You should not give to code-thefts an ability to use the Refractor or another decompiler utility on your Windows Store app for hacker’s purposes. You should secure your code with a best obfuscator. Obfuscation raises the reverse engineering protection. For the Visual Studio 2019 Windows Store apps Skater .NET Obfuscator makes good and reliable code obfuscation.